Guest rooms feature contemporary decor with stylish furnishings including the Hyatt Grand beds, state-of-the-art media and work center with a high-definition 42 inch flat panel television that easily integrates with laptops, a comfortable cozy corner L-shaped sofa-sleeper, wet/dry bar and bathroom vanity with granite counter tops. Enjoy complimentary wireless high-speed internet. World of Hyatt members can enjoy our complimentary breakfast when they book an eligible rate. Our breakfast includes premium ingredients, cage-free eggs, and regional chef-inspired dishes. PET POLICY: 1-6 NIGHTS A 75 NON-REFUNDABLE FEE. 7-30 NIGHTS A 75 NON-REFUNDABLE FEE PLUS AN ADDITIONAL 100 CLEANING FEE. MAXIMUM OF 2 DOGS PER ROOM ARE PERMITTED. WEIGHT MUST BE 50 LBS OR LESS MAX OF 75LBS PER RM. FEES ARE IN USD. 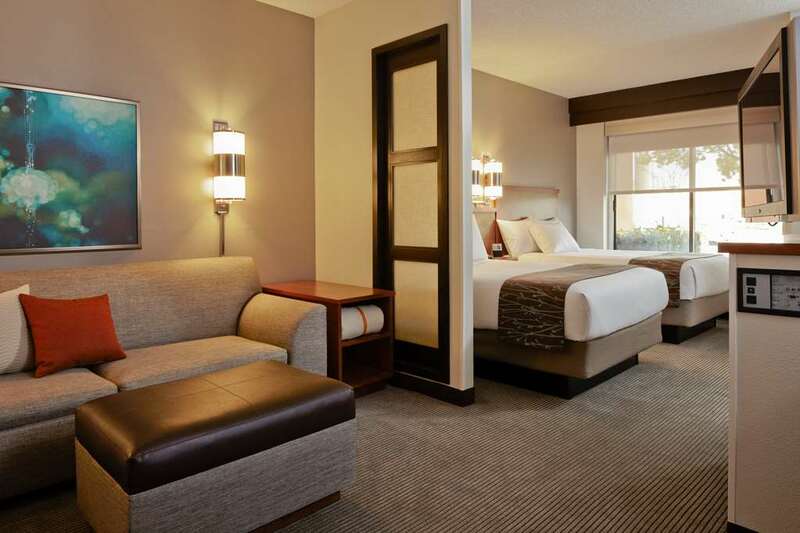 Hyatt Place Fort Worth/Hurst is conveniently located on Highway 183 between Dallas and Ft. Worth. and only 15 minutes from the Dallas/Ft.Worth Airport. Grapevine Mills Outlet MallGrapevine Mills Outlet Mall is the largest outlet mall in the area. NRH2o Family Water ParkNRH2o is a waterpark with rides for the whole family. Six Flags Over TexasSix Flags Over Texas Great Adventure is a world class family entertainment complex. Texas Motor SpeedwayTexas Motor Speedway is a motorsports haven along the historic Chisholm trail. Seating for 150,061 fans and 194 private suites.